Dear community, we have produced an open textbook on Pressbook with an open license based on the MOOC BOOK to provide you a structured, layouted and downloadable version of the MOOC BOOK online version. It contains all you need to know about Massive Open Online Courses (MOOC) for the world of business. 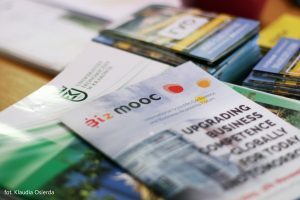 It was written by academics and business experts from across Europe as part of the BizMOOC project. Inside you will find a detail ed analysis of key literature in this field along with a range of practical tips for designing, implementing, evaluating and improving online learning at scale. Use this guide to understand the MOOC potential for you and your organisation. PDF, EPUB and other popular e-reading formats are available. Enjoy!